Feed the birds, tuppen’s a bag? No! Make bread pudding instead! It seems that my posts usually end up being baked goods, but to be sure, when I have the opportunity to make something new it usually tends to be a sweet treat. This time of the year, too, I'm all about comfort foods. This is a fairly standard recipe for bread pudding, which is good for not wasting old hardened bread that you would normally pitch out to the pigeons. 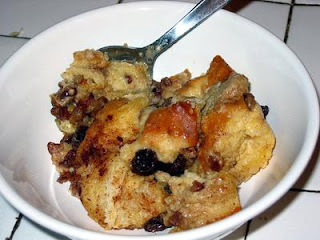 Bread pudding is also wonderfully versatile. You can add other fruits instead of apples (pears are good alternative), or try a coconut/banana version using coconut milk instead of moo juice and sliced bananas. Or everyone’s favorite – chocolate – by adding 2 oz. chopped bittersweet chocolate into the 1st step and omitting the apples and raisins. 1. Preheat oven to 350*. Over low heat in a small saucepan warm the milk, butter, half the cinnamon/nutmeg/cloves, ½ cup sugar, and salt until the butter melts. 2. Grease an 8” glass baking dish, and place the bread chunks inside. 3. Pour the hot milk mixture over the bread in the dish, let sit for a few mins for the bread to soak up the liquid. Beat the eggs briefly and stir them into the bread mixture, adding the apples and raisins too at this stage. 4. Mix the remaining 1 tbsp. of sugar with the rest of the spices and sprinkle over the top of the dish. 5. Set the baking dish within a larger baking pan and pour hot water in within an inch of the top of the dish. 6. Bake 45 mins to 1 hour, until a thin knife into the center comes out clean (or nearly so; the center should be somewhat wobbly). 7. Serve warm or cold, best with a few fresh berries and whipped cream. i usually disapprove of bread pudding but this sounds good.